Sam's blog to record my life and travel. The following thought-provoking list was announced at this year’s American Association for the Advancement of Science conference. We certainly have our work cut out as a species. 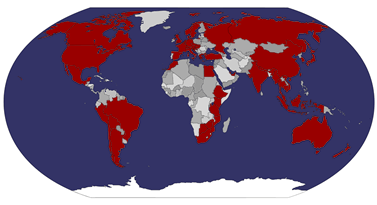 I guess if you want to help mankind out, you should be looking for a job in one of these fields.. In the morning I leave Riad, saying goodbye to the ever-friendly Abdullah who is the star of the place – the actual owner is a bit stand-offish and unhelpful. I pick up my postcards from the reception desk where they’ve sat since I gave them to the staff for posting, and take them myself to the post-office, a ten minute walk away. The friendly taxi to the train station (some sign language required!) refuses to take my money initially, and in the station the ticket chap takes some details from my passport, though from the way he looks at it I suspect he hasn’t a clue what any of the details are. They also security-scan my pack (not daypack) before the platform, a token gesture again, I suspect even if there had been a rocket-launcher inside they wouldn’t have realised. On the platform I chat with a couple of students from the University of Aleppo, they’re going up for an exam today, but don’t seem unduly concerned. In Aleppo I head straight round to the ticket windows, the first of which is the international window. There’s no one there, but the relevant chap is soon sent round when I ask at the next window. Whilst he copies details from my passport, I go looking for money – the ticket is 3,425 pounds, or about 37UKP, for the one class - Sleeper. The first ATM I find has several fixed amounts available, but the button for 4,000 doesn’t work, and there’s no option to type in any other amount. The second ATM, different bank, is the same, so I end up having to take out two batches of 2,000 – I hope they won’t charge me double fees for the withdrawals. Back at the window, I have to actively block to stop Arabs leaning in and interrupting my chap as he writes out my tickets. I get two, one Syrian and one Turkish, both written out with destination Haydar Pasha, i.e. the Eastern Terminus in Istanbul. I’m quite excited now! The train leaves tomorrow morning, Tuesday, at 11:10am – the chap advises me to be back at this station (Halab Baghdad Station) at about 10:30am. You need to bring food and drinks as there’s nothing on-board despite the journey being about 30 hours (and very possibly more if any delays experienced). The first cab who stops doesn’t know the Tourist Hotel, so I try another. This one looks a bit dodgy, nods, and seems to agree to my suggested price of 25 pounds, the amount the guy in the station told me it ought to be. We drove off, and I tried to ask him whether he actually knew where the place was, but I’d just receive a burst of Arabic back. He drove around a central touristy area, but we didn’t see the hotel. By now it was clear he didn’t know where he was going, and I was worried that he was going to try to charge me for his ignorance – he looked the type. Stopping at one hotel, he beckons me out to ask the staff if they know where the Tourist Hotel is. We find someone who points us to another area. Driving round again, we stop at another hotel, and I’m asked to get out again. I’m started to get annoyed now – regardless of the price this is a serious waste of time – if he’d only told me he didn’t know in the first place. Finally he works out where it is, but as I get out, he tells me the price is 300 pounds! What a joke! I refuse, and tell him it should be 25 or 30. People join in the conversation, trying to mediate. One chap suggests a compromise, that I pay him 150. No. 100 then. I offer 25 or 30, or nothing. He doesn’t take it, so I walk away to the Tourist Hotel, telling him he’ll find me there. He follows me. Upstairs in the Tourist Hotel, a friendly chap sits behind the desk. I say hello, then explain the situation. He talks to the driver for me, and ends up arguing with him too! He says the price these days should be about 50-75, but it’s clear the driver is trying to charge me for driving all over town. I give him 75 in the end, just to get rid of him. Then the Tourist turns to be full anyway, so I head along the street and end up at the grotty Syria Hotel for 400 a night. Just for a night. I head straight out. What's the time? : Kam al saa? Anyway, in many ways, Aleppo is a nicer and more relaxed city than Damascus, despite being the centre of Islam in Syria – one sees more women wearing a chador here. The locals call the city Haleb (there are plenty of speculative theories as to why this is, but I gather nobody actually knows). The city was an ancient trade centre – and is mentioned in two Shakespeare plays – Othello and Macbeth. The TV here shows adverts for a Gillette Body Shaver – like a Mach3 or something, but for armpits and body hair. But for boys! Is this something new in the UK too, or an Arabic thing? I’ve also noticed Arabic ladies dressed in black, only eyes showing, giggling away eyeing up fancy dresses and so forth in shop windows. When do they wear this stuff? In the house behind closed doors?! First up, something to eat. I’m recommended to go to a little area on Baron Street, just up from Baron Hotel, where LP have “News Stand” marked on the map. Next to this are lots of eateries, and at the end, a fantastic pastry shop serving up pies and mini-pizzas, really tasty, all straight out of the oven, for next to nothing in terms of cost. Mental note- I will be back! Next some tourism, and first up, I pop into the tourist office (happened to be passing anyway). What a helpful chap I encounter! He kits me out with a free map, a brochure all about Aleppo and its history, and writes out an itinerary for the few hours I have here, writing all the names in Arabic on a piece of paper for me so I can show people to ask! Very impressed! So, off to the citadel. I pass a shop selling nothing but dates – “Alzawwak Dates”. They have large trays full of different varieties around the shop, perhaps 10 different ones! I ask about prices – there are fancy once for 400 a kilo, or cheap ones (which look it) for 75. I try to find a compromise, and end up with 175 a kilo dates, which are particularly soft. He gives me a couple of the expensive ones as I leave. Arabic customers walk in and buy large boxes – imagine how much they’d cost in the UK, the lucky sods! Most of the dates are from Saudi Arabia, but he has some from UAE too. Rounding a corner, I emerge in front of the enormous citadel. I‘m surprised at the size of it – it’s bigger than Krak! The castle itself sits on a 50m high man-made earthen mound – hence dominates the city skyline. On the southern side, its moat is spanned by a bridge that then climbs up a 45 degree angle up to the imposing 12th century fortified gate. I pay the 150 pounds entry fee (10x the local price) and head up. Inside, there’s a very large space filled with all sorts of buildings and ruins. There are archaeologists excavating on the far side of the complex. There’s a museum inside, using the building previously an Ottoman barracks, but they charge an additional 75 pounds! I think not! I head up the towers for a marvellous view from the battlements. On the way out I visit the restored Throne Room with its marvellous ceiling. into Souk al-Atarin, which dates from 1574. It’s a covered shopping mall passage, extending in all directions and covering several hectares, sometimes with a vaulted stone ceiling, filled with shops selling fabrics, spices, shoes, everything one could imagine. Some parts of the dimly lit markets date to 13th century, but most are from the Ottoman era. There are also “khans”, ancient shopping complexes, the most impressive of which is Khan al-Jumruk. At one time apparently it housed the consulates of the English, Dutch and French as well as 344 shops! The Grand Mosque also sits adjacent to the souk, but I pass. Apparently construction finished 10 years later than the Umayyad Mosque. I come out via the Qennesrin Gate. The weather turns terrible… again!! What is it about Syrian weather – every day about mid-day the rains roll in. It’s like an English winter, dark, wet and miserable! I see some nice looking pasteries, so pop in to the shop. Unfortunately they turn out to be sweet biscotti almond things, which are pretty awful – actually I take that back, I’m sure they’re nice, but I just don’t like them - but as they gave me one to try I feel compelled to buy a few. They offer me a kilo. No thanks. I end up with five – they’re long things, I don’t need more! Tomorrow I’ve got a 36 hour train journey on a train with no food or drink, so I’ve been stocking up. I’ve got dates, bananas, and tomorrow morning I’ll grab some bread and hummous, perhaps some of the mini-pizzas I found for lunch today. However, I’d also like some booze. Now, finding booze at the best of times in the Middle East (when you’re not with a local) can be a pain, but especially here where it’s the Islamic capital of Syria! It’s as hard as finding internet or freedom of speech! Eventually I come across a “Euro Grocery” place, which has Meister beer. I also buy a bottle of Syrian wine – the most expensive they have, at 250 pounds – hopefully it’ll be drinkable – a St Simeon (which is a small ruined church outside of Aleppo) 2005 red. We shall see. 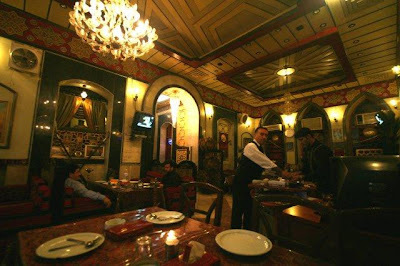 For dinner, I’m sent to Al Kommeh, a few blocks away, just off Bab al-Faraj. The chap who directs me to the place had lived in Hastings! 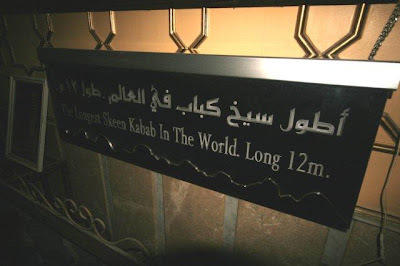 Anyway, I head upstairs, passing the photos of the kebab which got this restaurant into the Guinness Book of Records for World’s Longest Kebab – 12 metres in fact! They made a record-beating salad to go with it too, and a silly piece of bread. I don’t go for a 12m kebab – the regular Kebab Aleppo will suffice, with hummous and to my delight, freshly baked bread again! I’ve been pining for the stuff since Al-Khalawi in Damascus – this isn’t as good as that, but it’s still nice. Some good dishes on the menu – the Lamb Brain with Fries is recommended, or if that doesn’t take your fancy, perhaps Sir would like the Lamb Spinal Cord? It takes ages to find an internet place – there are hardly any in this city, even in the budget hotel area, but eventually I stumble upon a café called “Concord Internet”, where for 100 an hour I get my laptop plugged in, and book the ferry from Patras in Greece to Venice with Minoan Lines. Anek also do the same route, but are more expensive and I came across a blog which tipped Minoan. So I’ll be leaving Greece late on the 28th and arriving into Venice on the 1st March. Just near the FAG shop (sells car accessories I think), which in addition to the large sign saying FAG in neon red has stickers all over the window saying FAG repeatedly (I’m just sayin’!) I spot the best mis-spelling I’ve seen in a while – a rather insalubrious place with a sign above saying Nichten Klup! I might head down there tonight to dagnse the nighten awag! Buy me stuff on Amazon! To the Simien Mountains and Back Again! This page uses Analytics to read your mind, muahahaha!